Srinagar, Feb 8: Two persons were killed, while 10 others went missing and hundreds remained stranded on Friday due to the heaviest spell of snowfall in Jammu and Kashmir so far. A couple was killed while their two children were rescued after an avalanche destroyed their home in Kokernag area of Anantnag district late on Thursday. Six policemen, two Fire and Emergency Services personnel and two prisoners went missing after another avalanche hit a police post near the Jawahar Tunnel on the Jammu-Srinagar Highway . Relief and rescue efforts on Friday have traced one of the missing, police said. Multiple avalanches occurred at many other places in the Kashmir Valley, however, due to lack of communication and connectivity the extent of casualties or damage, if any, was not yet clear. Authorities have shifted 78 families from avalanche-prone areas of Waltangoo Nar and Kund in Kulgam district to safer places. Seven families were shifted to the Khag police station after an avalanche hit their village in central Badgam district. Another, 20 families were shifted to safer places from Ganderbal. Reports of seven to eight feet of fresh snowfall in the higher reaches and one to two feet in the plains in the past 24 hours indicate that this has been the heaviest snowfall of the season so far. 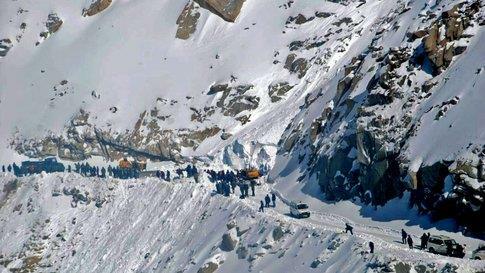 Hundreds of people were stranded in Jammu as the Jammu-Srinagar highway was shut for the third consecutive day after multiple avalanches and landslides hit various stretches of the 300-km long road. Hundreds of Kashmiris were reported to be stranded in Delhi as flight operations remained disrupted since Wednesday and were completely closed at the Srinagar international airport on Thursday. Morning flights could not operate to and from the Srinagar airport but operations were likely to resume shortly as the weather has improved significantly. Electric power supply, water supply and road connectivity was also severely affected in the state. Senior engineers of the electricity department said they supplied 850 megawatts of power to the valley on Thursday against the usual 1,200 megawatt requirement. Despite these figures, most areas in the Valley and also some in Srinagar city remained without electric supply during the last 36 hours. Water supply in areas where electricity is needed to operate drinking water plants has also remained adversely affected. Roads in Srinagar and those connecting different district headquarters have remained partially closed since Thursday. Restoration of all road links in Srinagar city and inter district road connectivity was expected to be completed by afternoon. Availability of essential commodities including food items and petroleum products has been hit by continued closure of the strategic Janmu-Srinagar highway through which all essentials supplies are routed into the landlocked valley. Mutton, poultry products and vegetables have vanished from markets in Srinagar city and other places. Alarmed by depleting stocks of petroleum products, local administration has ordered rationing of petrol and diesel till the supply position improves. This season's snowfall has dispelled fears of water shortage in rivers, lakes, streams and springs during the coming summer months. At the same time, the vagaries of nature have also taken their toll causing serious hardships to the people.